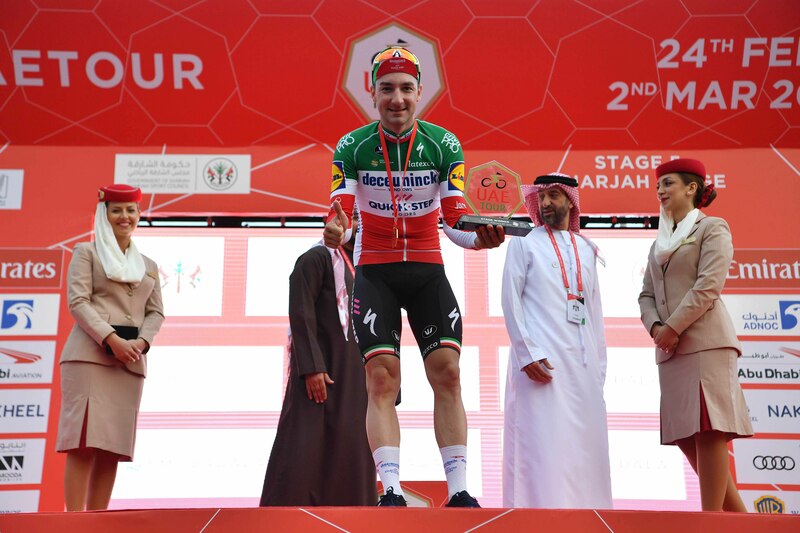 Italian National Champion Elia Viviani (Deceuninck – Quick-Step) put in a late burst of speed to take the win on the fifth stage of the UAE Tour. 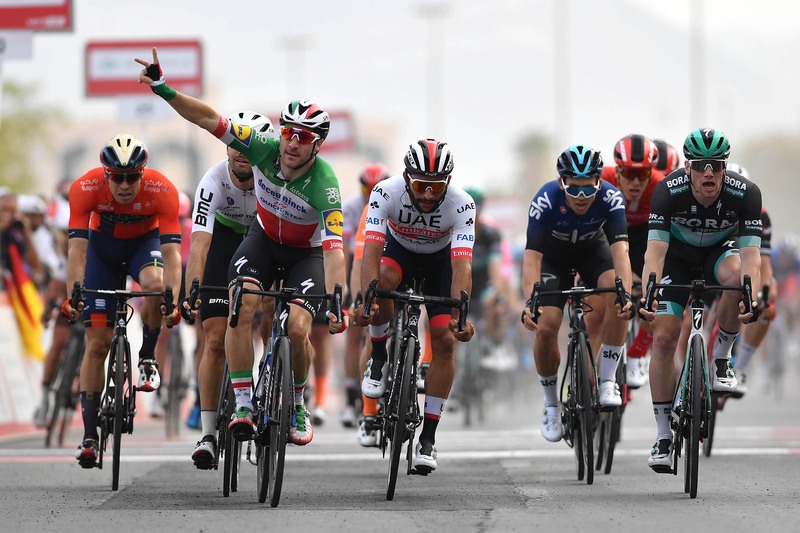 The 181-kilometre stage took a route that crossed from the coast at Sharjah, along a mainly flat course to the tips of the Indian ocean at the other side of the peninsula at Khor Fakkan. There they were greeted with a fast and mainly straight run-in which was destined to end in a sprint. 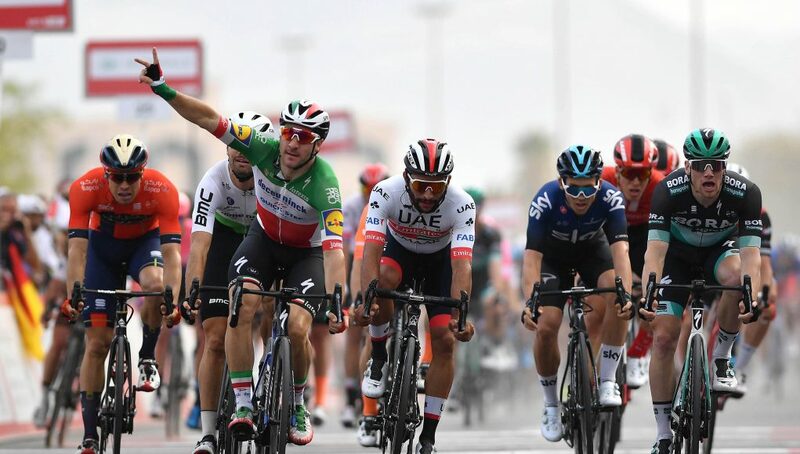 As has become customary during this year’s UAE Tour the day’s breakaway consisted of members of both the Gazprom and Novo Nordisk, with Tepan Kurianov, Anton Vorobyev, Sergey Shilov and Charles Planet and Fabio Calabria representing the respective teams. 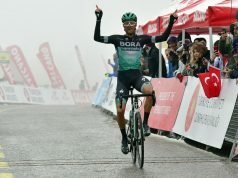 With the peloton aware that the group would be looking to pick up enough points defend the green and black jerseys of Planet and Kurianov, they were allowed to build a steady lead that never threatened the impending dominance of the sprinter’s teams, and were reeled in with relative ease at the 30-kilometre to go mark. The pace was then kept steady in the peloton and Mikkel Honore could be seen policing the front of the peloton for long periods of time in the lead up to the final run in. After a roundabout with 3.5 km to go, Dries Devenyns put in a turn that would pull Deceuninck – Quick-Step into a strong position. 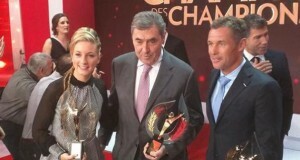 Viviani had a slingshot towards the finish, after being policed by Michael Mørkøv and Fabio Sabatini. 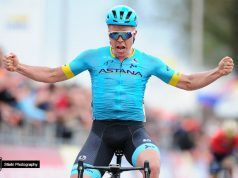 For a agonizing few seconds he looked to be short of the pace of Fernando Gaviria again. 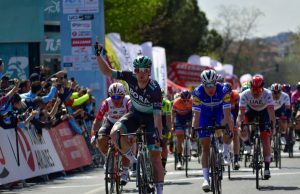 However, Viviani stayed patient and a late burst saw the Italian take the win.